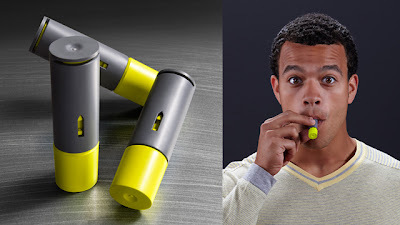 Each puff of this inhaler delivers 100mg of caffeine, the same amount as a large coffee. What your actually inhaling is a fine powder. Not sure that it can replace coffee anytime soon. However, there are many benefits to using this product as a source of energy. It contains 0 calories and no sugar which is a great way to avoid gaining weight from an energy drink. It was developed by David Edwards a Harvard professor who has made some interesting innovations involving instruments in which individuals inhale foods.